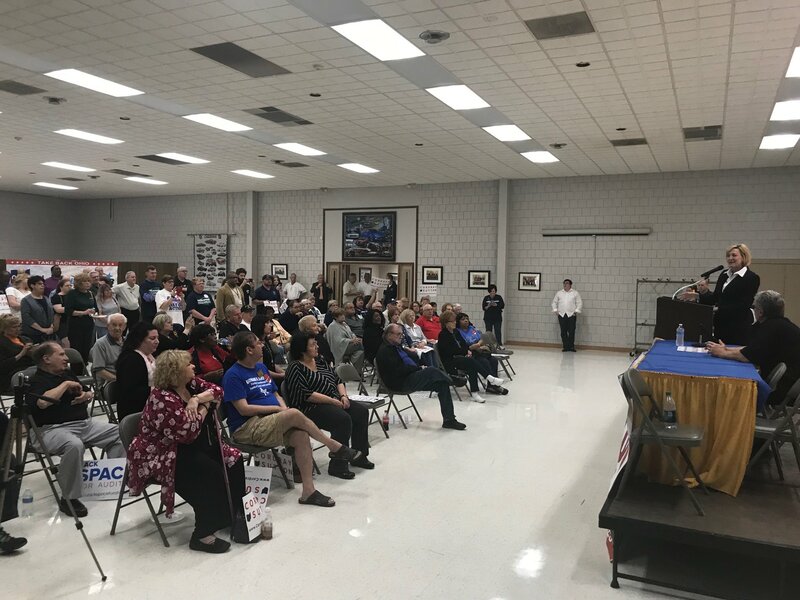 Lordstown – On Monday evening, a large group of union members, leaders and activists held a rally at UAW Local 1112 in Lordstown to kick-off the Labor 2018 election effort to elect worker-friendly candidates in the 2018 elections. “The stakes could not be higher,” said Ohio AFL-CIO Secretary-Treasurer Petee Talley of the 2018 elections. “After years of seeing the system rigged against us, working people are engaging in this campaign because we know that our freedom to negotiate is on the line,” she said. “In 2018, we have a slate of endorsed candidates that have the backbone to stand up against the powerful out-of-state interests that seek to take away our rights, whether it be our right to vote, or our freedom to join in unions,” said Ohio Association of Public School Employees Executive Director Joe Rugola. “Sherrod Brown, Richard Cordray and the entire statewide ticket have earned our endorsement. We stand with them because they stand with us,” Rugola said. “This rally represents the start of something big here in the Mahoning Valley,” said Mahoning-Trumbull AFL-CIO President Bill Padisak. “Our membership is energized and ready to engage in the campaign to re-elect Sherrod Brown, make Richard Cordray our next governor, and elect candidates up and down the ticket that support working people,” he said. “It’s time we take back our state,” said State Senator Joe Schiavoni. “Rich and Betty have always fought for workers’ rights and working families and actions speak louder than words,” he said. “The support of working people across the state is critical,” said Secretary of State candidate Kathleen Clyde. “We need to have every voice heard and I am committed to making sure our elections are fair and secure for everyone,” Clyde said. The Lordstown event was the first of six regional kick-off events across the state with other events scheduled this month in Marietta, Cincinnati, Cleveland, Columbus and Toledo.